The tint of yellow is too strong (#FFFF00): 100% luminosity and saturation! The choice of yellow is not appropriate, with reference to our brand values. We stand for clarity of vision, positivity, hope in the future, trustworthiness, knowledge and cold facts. Appropriate colours would be in the light and cold range: blue, green. Certainly, hot and passionate colours are 180° from what we are trying to communicate on this site. The dark, almost black background is also a poor choice. It is attention grabbing for no reason and it communicates the wrong brand values again. White is certainly more appropriate for clarity of vision, positivity, hope in the future, trustworthiness, knowledge and cold facts. Please rethink the design and remove the yellow and black completely. The mismatch with our brand value makes us look like armchair detectives and it strongly undermines our credibility. Furthermore, it impedes prolonged usage of the site. It is simply not acceptable. Mostly in response of Tim Farley, asking for some references in the comments, I'm adding this addendum. The meanings of color. by Wright, Benjamin; Rainwater, Lee, Journal of General Psychology, 67, 1962, 89-99. I agree with this - Skeptics currently has the worst UI of any Stackexchange site. It is too "blocky." 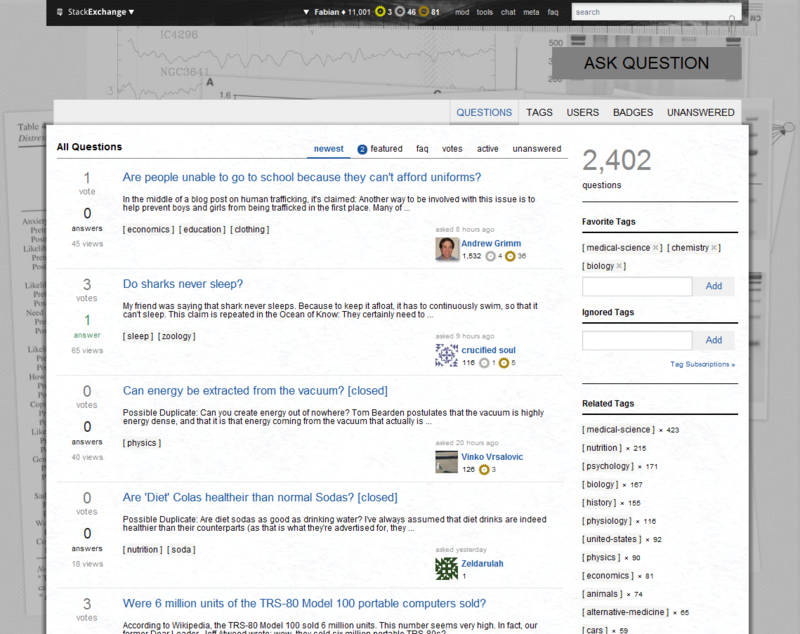 Compare, for example, the up/down-vote icons of this site with literally any other stackexchange site. The side-bar has poor formatting. Look at the side-bar (right-side of the page) - it looks like one large blob of text. Now compare this with the sidebars on other sites. It has way too much whitespace at the bottom of posts. Compare the location Add comment and Show more comments buttons on this site with other sites. On other sites, the buttons look like they are "grouped" together with the comments as one logical unit, but on this site they look like a completely separate thing. Several times on this site I have read through the comments on a post, only to realize there were more comments that were hidden - I've never had that issue on other stackexchange sites. The Add another answer button has the same issue. The color scheme, again. Particularly, the fact that links are the same color as text - that is a huge no-no. For instance, scroll down to the bottom of the page, where it says "Or ask your own question." You cannot tell at all that that's supposed to be a link, without hovering your mouse over it. Also, the "up/down-voted" icon is too similar to the "haven't up/down-voted" icon. Not friendly with older browsers. According to this, 10% of all users still use IE 7. Unless we want to exclude that 10% of users, we should still support at least IE7. Stackoverflow and most other stackexchange sites do; this site does not. Not the answer you're looking for? Browse other questions tagged bug feature-request design . This site is for discussion about Skeptics Stack Exchange. You must have an account there to participate. Site design updates are on the way! Can we redo the design? I don't see anything good in the new design? New Skeptics Design Has Launched! Is the new design a keeper?